Skipton Auction Mart launched its 2009 pedigree beef season with the traditional pipeopener, “Blue Wednesday” - the fifth annual show and sale of pedigree British Blue breeding cattle. (Wed, April 29). The championship went to a young and promising newcomer to the exhibition arena, a November, 2007-born heifer from the High Moss herd of GW Wallbank, of Keasden, Clapham. Shown by Jack Wallbank, High Moss Chardonnay is a well muscled daughter of the fertile Belgian sire Fanion De Ronchy, with the straw sourced through Norbreck Genetics, of Cockerham, Lancaster, who have been successfully using the bull since 2005. The dam is the Wallbank’s own Currarie U2. The victor sold for 2,000 guineas to Stephen Swales, of Melbourne, York, a familiar face at the Skipton ringside. The same dam was also responsible for the Wallbank’s third prize heifer, High Moss Donna ET, a March, 2008, daughter of Jaguar De Pierrecome, and who sold for 1,900 guineas to Martin Sharp, Stainforth, Settle. Last year’s champion Gareth Hogg, who farms with his father Keith at Well House Farm, Copgrove, Harrogate, had to be content with the reserve championship this year with his pedigree bull Copgrove Blaze, who was also making his first foray into the show arena. The three-year-old son of the Belgian-based and now retired sire Visconti De St Fontaine is the second calf of the Hogg’s own Gregmaur Vivian. The runner-up has already sired a heifer calf and sold for 2,300 guineas to Tim Metcalfe, of Clayton, Bradford. 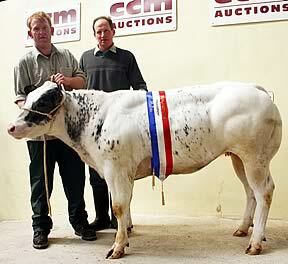 Top call in show fell to a pure-bred white bull from David and Rachel Capstick, of Swinden Moor Head Farm, Hellifield. The May, 2007-born son of Serum remained in the area when acquired for 2,400 guineas by Oldfield Bros, of Demense Farm, Gisburn. British Blue bulls averaged £2,240 and females £2,047.50. Show judge was Joe Throup, of Silsden. Skipton’s 2009 pedigree beef season continues on Wednesday, May 13, with Craven Limousin Day, the annual show and sale of pedigree Limousin breeding bulls and cattle – there is a 51-strong entry - coupled with the high profile 2009 Northern Limousin Extravaganza. The third and final event on Wednesday, May 27, is the Ling Fields Beef Cattle Fair, featuring the annual multi-breed show and sale of pedigree beef breeding cattle and Spring breeding bulls, supplemented by the annual show and sale of pedigree British Blue females.